Pay shipping on this heavy thing and ill sent it to you. The mail man might slasher your tires. Recommendations on what paint to use on trailer floor. Was think bed liner but i want to do it blue or maybe a epoxy. I put that behr deck over on the trailer this year. No clue how it will hold up to chemicals but it was like trying to paint with sand. Looks nice with a good texture though. 32 a gallon I belive. It only took one gallon for a coat on a 12x6.5. If you use it make sure they shake the crap out of it. 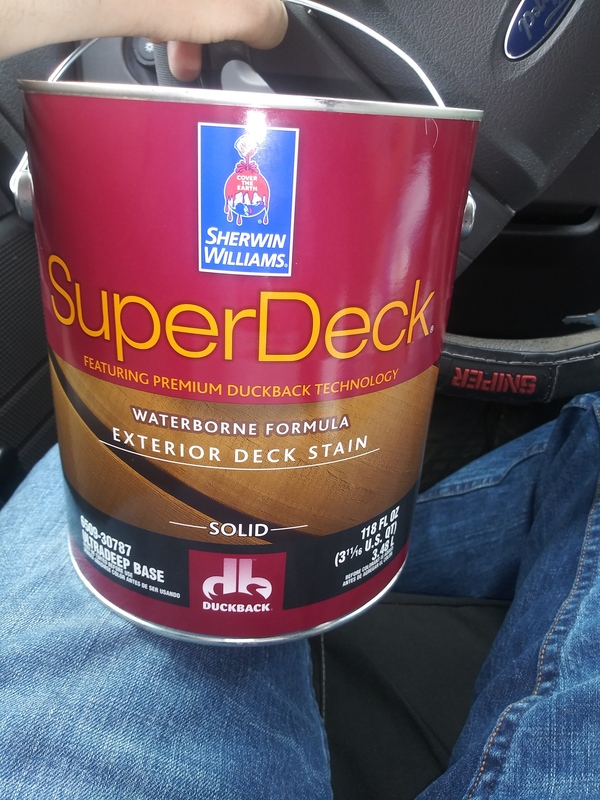 I used a heavy oil base deck stain (2 coats) and it’s holding up well except in places where straight SH drips on it and in those places it’s brutal. Stripped right to bare wood. Im buying some right now. Thats what i feared was SH fading it. Trailers back at high school right now for the ladder rack so it wont be until next week till i paint it. I have a drill bit attachment for mixing paint and he also said i could bring it back anytime to be shook. I just hate that you supported that paint manufacturer. I paint my enclosed every year. I recommend putting something down like a mat in an area where you keep thowing sh jugs or buckets. The paint will chip and water will make its way under the paint and cause more chipping. I put a 3x4 mat from Home Depot at my side door entrance. Never thought about a mat TSC sells it by the foot. @Steve whats wrong with Sherman Williams? Saved me another 40min drive to lowes or home depot. I thought the price was going to be expensive but it was only $32. Thats what i wanted to go with was a marine epoxy but i figured its would crack alot painted on soft wood. Isn’t that stuff really hard when it drys? They are making a bunch of paints that discolor when you soft wash them with bleach mix, and they won’t stand behind their product, so the cleaning contractor is left holding the bag. Ya i was waiting in line reading thier product book and seen alot of “mildew resistant” paint. I was thinking if this really works ill be losing business. Must have something organic in tbe paint i guess? Yeah, from what I understand, it’s organic pigment. SW blames the EPA for pushing paint manufacturers toward that, so who knows? I just recently had my house painted and had the painter use Benjamin Moore paint. From what I could tell the BJM paint was a high quality, so that’s my go to brand for now.